Good art sheds light on the human condition. Great art shows that the human condition never really changes. It’s why Sophocles’ dramas, when they’re still taught and performed, still make sense to audiences thousands of years later, and why in Melbourne later this year an Aboriginal drama company will stage an adaptation of King Lear: across culture, across time, human nature never changes. It’s also why a film like Paddy Chayefsky’s Network is required viewing, or re-viewing, for anyone shaking their head at the current and utterly depressing state of America’s politics, economy, and so-called mainstream media. 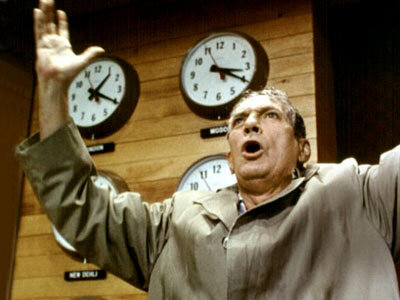 Network was made in 1976 with the action taking place against the background of a corrupt and decadent media; a disaffected, down-in-the-dumps America; cynicism about corporate control of just about everything; and a general fear that things were going to get lot worse before they got any better. Which, from the perspective of this American abroad, sounds a lot like the US of 2012. I was thinking about this in the hours after a lunch at Masuya, a nondescript Japanese diner in O’Connell Street in the CBD. Several years ago I worked just around the corner from the place, but had little idea it was there. The entrance is discrete, and diners have to descend a flight of stairs that’s tucked around a corner. From the outside it looks like the currency of the realm might just be “Dancer Dollars”. Never mind, it’s worth a visit – indeed, becoming a regular. 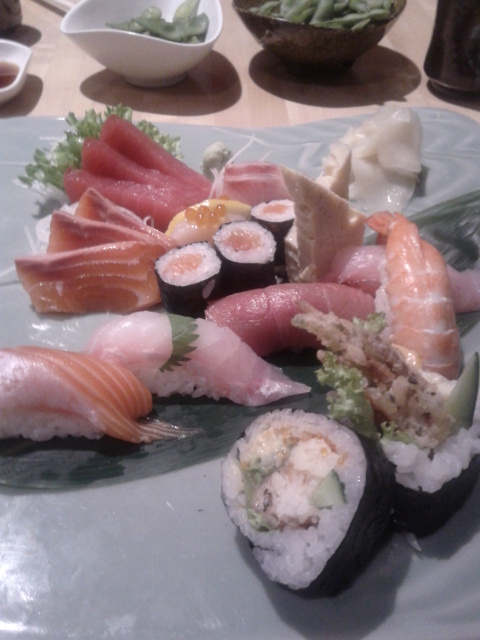 The sushi is fresh, luscious, and diverse; my companion’s tempura chicken bento box almost gave me a case of menu envy. Service was friendly, brisk, and efficient with an eye towards keeping tables turning over and getting the Salarymen back to work. That’s the other thing: it’s a great place for a business lunch, because the acoustics are such that while there’s a substantial ambient rumble of voices that makes it all but impossible to eavesdrop, the placement of pillars means you can always hear the person across the table. Would that the conversation, with an Australian deeply concerned about the state of the US and indeed the state of the world, was so cheery. Over the course of the hour we dissected in minute detail all the things that could happen between now and November – at this point the news that the US Ambassador to Libya was killed by Islamist nutters had not yet broken, though the storming of the Cairo embassy was front-of-mind – and just what Obama’s people might do to keep power in a close race. We talked a lot about how similar things felt to the ‘70s: the Oil Crisis, the Tehran embassy siege, the feckless, apologetic foreign policy, the bankrupt cities (back then it was New York, not Chicago), the comparisons went on and on. It was sobering, and not just because the only tipple was green tea. But on reflection, life goes on. Human nature goes on. America went through the 1970s and survived. In fact, out of that slummy miasma of a decade, of which Network provides a damn fine time capsule, emerged Ronald Reagan. Back then, there was little to do but yell out your window. There was no internet, there were no blogs or alternatives to the MSM. There was no Tea Party. Four more years of Obama is not inevitable, nor is American decline. The world came out of the torpor of the Seventies and a decade later the Soviets, who were supposed to bury as all, were finished. China, in its present form, is likely headed for a similar fate as its own bubbles unwind: freer societies, on balance and over time, prevail, even if there may be a lot of chaos and structural adjustment in the meantime. But just because the same damn battles have to be fought over and over again doesn’t mean they’re not worth fighting. Australia and America both need a Ronald Reagan right now. Unfortunately for the GOP, Romney is no Regan.